I am sorry to learn that Brigadier General Phillip Thomas Boerger had recently passed away. Pete had a unique relationship with West Point. A relationship to which I was a fortunate witness. Pete's brother, Frank, and I were members of the ROTC at the University of Minnesota, class of 1944. We were also fraternity brothers in Sigma Nu, where Frank was the chapter commander (president). Frank's younger brother, Pete, came to the university in about 1942, pledged Sigma Nu, and was elected pledge president. On the Monday after Pearl Harbor, the ROTC instructors advised us to stay in school until we were called to active duty, following which we would become second lieutenants. In early 1943, in lieu of our last year of ROTC we were sent to basic training and then scheduled to attend officers' candidate school in lieu of ROTC summer camp. During basic training, Frank and I possessed the needed score on the Army intelligence test to qualify for an Army appointment to West Point and appeared before a selection board. A few weeks later we were ordered to Amherst College with about 400 other enlisted men from around the world. We were to attend a West Point preparatory course for nine months and then take a competitive test for 110 Army appointments to West Point. We were surprised to find Private Pete Boerger waiting for us to arrive. All three of us won appointments to West Point. General Eisenhower returned to West Point for a visit in June of 1945. The more senior classes were on leave and the only cadets present were new yearlings (sophomores). Pete had the honor of being selected as the commander of the parade for General Eisenhower. In that era the cadet corps consisted of two regiments. In our senior year Pete was selected as the commander of one regiment and Frank the commander of the other regiment. It was unusual to have two brothers in the same class, and unprecedented to have brothers as cadet regimental commanders. Frank was also elected class president and graduated number two academically. Pete academically stood a respectable fortieth out of three hundred and ten. 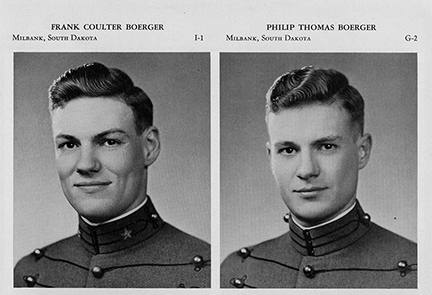 Both became members of the prestigious Corps of Engineers and both served terms on the faculty at West Point. Pete retired as a Brigadier General. After retirement he was active in class affairs¸ including using his musical ability to organize and direct a choral group to serenade us at our many reunions. Frank died in 1990. He had retired in 1969 as a colonel to accept a civilian position. Possibly he was frustrated by a policy which precluded his further promotion in requiring all selectees to brigadier general to be less than forty-five years old. Fortunately the policy was not in effect in 1939 or Eisenhower would have retired as a colonel.